The Document Viewer enables you to view documents stored in your case, often in a application specific rendered version (such as PDF) and as text, native (if available). Additionally, from the document viewer you can enter and edit coded data about the document and add and edit notes and facts. You can view a document by clicking on any link to the document in Lexbe eDiscovery Platform, such as from the 'Search', 'Browse' or 'Facts & Issues' pages. When you open a document from the Browse, Search or Fact & Issues pages, a listing of up to 25 of the documents displayed in those pages will be carried over to the Document Viewer. In the Document Viewer, you can navigate back/forward in whatever tag view you are in using the navigation arrows at the top of the page (e.g. '<Viewing 2 of 25:>'). 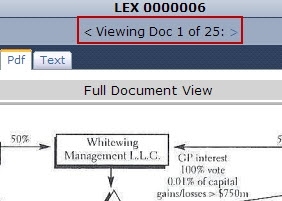 When viewing PDF documents, Lexbe eDiscovery Platform makes use of the PDF file viewer installed on your computer and associated with the PDF file extension. To learn about the fully functional version of Adobe Acrobat Reader open our (Help Page-Doc (multi-page)). Some of the functions mentioned above may also require that you sign with Adobe Reader and get a Paid Account, which is not part of Lexbe eDiscovery Platform services. 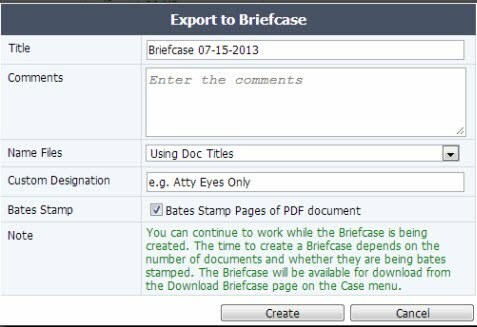 The 'Export to Briefcase' hyperlink allows you to copy a single file (the current document you have opened) onto a local computer or network in an zip file. To complete this function, click on the 'Export to Briefcase' button. Title: Unique Name for your briefcases being downloaded and by default it will display 'Briefcase MM-DD-YYYY. Name Files: You can name the files using the 'Doc Title', 'Bates Numbers' or 'Doc Dates'. Custom Designation: You can enter full text messages usually up to 100 characters (e.g. Confidential Subject To Protective Order). For further help, please see section called 'Preventing Inadvertent Disclosure Of Confidential Information' under the Bates Stamp Help Page. >You can separately download the native files including MSGs and container files from the Briefcase page, which is not intended for productions and does not have the same safeguards. You should carefully assure yourself that no privileged, work product or redacted documents are part of produced container files, if you elect to do this. >This function is meant for a limited one document, and is not intended as a substitute for conduction a document production. See the document production module for that functionality. You can show and hide the side panel in the document viewer at the top-right corner of the screen. This enables you to devote more screen space to a document, while easily getting back to the document, discovery, notes and facts tags when needed. 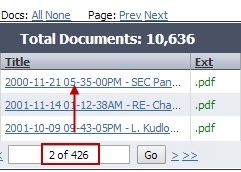 When you open any document in the document viewer you initially see a panel on the right that includes tagged information about the document, discovery, notes and facts. The Document Viewer is divided between a document view on the left and a coded data view on the right. The left view represents the document itself and the right tabs includes data that you have added to the database in Lexbe eDiscovery Platform to describe or categorize the document. These two views are further divided with tabs. The left document view can include up to five tabs, representing a 'Text View', a 'Page View' a 'Document View' and a 'Hits View' (available only when clicking from search results) and 'Original View'. Html View. View the extracted text version of the original documents without using applications outside Lexbe eDiscovery Platform. This view will not have any page brakes, OCR and is a not print-formatted version. Please also note that this feature is currently only available to new cases created after 09/16/2013 or old cased re-indexed. If you would like to take advantage of this new feature please contact us. Note that you can 'Hide' this panel to view the full documents. >Only click once for a function. Multiple clicks can slow or send conflicting instructions to the server. Lexbe eDiscovery Platform document viewer supports over 100 file types. These can include Adobe's PDF file format, native file types such as Word, Excel, PowerPoint and other Microsoft office file types. You can also view many JPEG, BMP, TIFF and other graphic file types. All the documents on Lexbe eDiscovery Platform are read-only. The only way to permanently change the rotation of a document is to download it, change the rotation (through Acrobat Professional or some other PDF editing software) and then re-upload the document to case. In Lexbe eDiscovery Platform when you open an Excel Spreadsheet without installing additional software, the content will be displayed as simple text without formatting. For simple spreadsheet the formatting can be retained and is searchable but for more complex spreadsheet, formatting is lost and they are not readable. If you want to view the document in its original format, click on 'Download' from the side panel in the document viewer at the top-right corner of the screen. To retain formatting and display, spreadsheets should be converted to PDF before upload. This can be done with a number of inexpensive (or sometimes free) utilities and print drivers. Here is an example:http://www.a-pdf.com/office-to-pdf/index.htm. We also offer a paid service called Native to PDF+ for large volume conversions: http://www.lexbe.com/hp/Electronic-Discovery-Services-Lexbe.aspx. When you open a document in the Document Viewer>Doc Tab by clicking on any link to the document in Lexbe eDiscovery Platform, such as from the 'Search', 'Browse' or 'Facts & Issues' pages, you will be able to navigate in the Document Viewer to next/previous Doc Title. This function is located in the upper right corner of screen. Lexbe eDiscovery Platform also supports for downloading a TIFF document from the DocViewer (as zip file). Open a tiff document by clicking on any link to the document in Lexbe eDiscovery Platform, such as from the 'Search', 'Browse' or 'Facts & Issues' pages. When opening a tiff document, you are given the option of opening your document in 'document view' or 'page view'. Page view is much faster as only one page at a time is opened and you may only need to see a few pages. If you choose to open the PDF view of the document clicking on 'Doc-multi-page' the entire document will be downloaded. It may take a few minutes, depending on your document size and your Internet speed. You can download a tiff document by clicking on the 'Download' button on the upper right of the document viewer, then your browser will prompt you to download the zip file to a location on your computer or LAN as directed by you. If given an option, select 'Save As' rather than 'Open'. Once you do this, you download will commence to your computer and you will see a browser-based download bar. Click 'OK' to complete download. Once you downloaded the file, your computer uses a program such as WinZip to expand the file back to its original size. Double-click on a Zip file and it will open in Explorer, just like a folder. Double-click on any file inside the compressed folder and you will be able to open and view the documents with Adobe Reader. If you upload files such as WMV, WMA, MP3, AVI or MP4, to open and view them just click on the link 'Title'. Once the file is open from the Document Viewer page a new window will give you the option to open or save the file to your desktop. Depending on the size of the file you will see a message giving you the option to either click on the 'Switch to Page View' or 'Stay in Native View' button that a hot link will be displayed giving you the option to save or open the files locally. If you want to print multiple documents, Lexbe eDiscovery has a few options.